Concentrations of 137-cesium continued their increasing trend in September based on results from our coastal monitoring network. None of the Fukushima fingerprint isotope, 134-cesium (134Cs) with its short 2 year half-life, was detected in any of the September samples. The lack of detected 134Cs in the samples is becoming less surprising as months continue to pass since we are approaching six years since the accident, which is three half-lives of the fingerprint isotope. This means that as of the September sampling, only about 15% of the original amount of 134Cs remained in the environment. We can predict what the current levels of 134Cs should be in the environment if we remember that both 134Cs and 137Cs were released from Fukushima in roughly equal amounts. Given that current levels of 137Cs continue to measure roughly 1 Bq m-3 above the background level, background present due to weapons testing in the 1950s and 60s, and the decay that has occurred of 134Cs, there is roughly 0.15 Bq m-3 of 134Cs in each of these September samples. That is below our threshold for detection (approximately 0.2 – 0.3 Bq m-3) for our typical 24 hour run on the gamma spectrometer. As time goes on, it will become cost prohibitive to detect the Fukushima fingerprint, 134Cs, in the samples, but we can continue to track the plume through the longer-lived 137Cs signature that we are currently seeing. The most recent data we have from offshore sampling along Line P would suggest that activities of 137Cs may rise to roughly 5 Bq m-3, or slightly more, as the core of the plume pushes inshore. 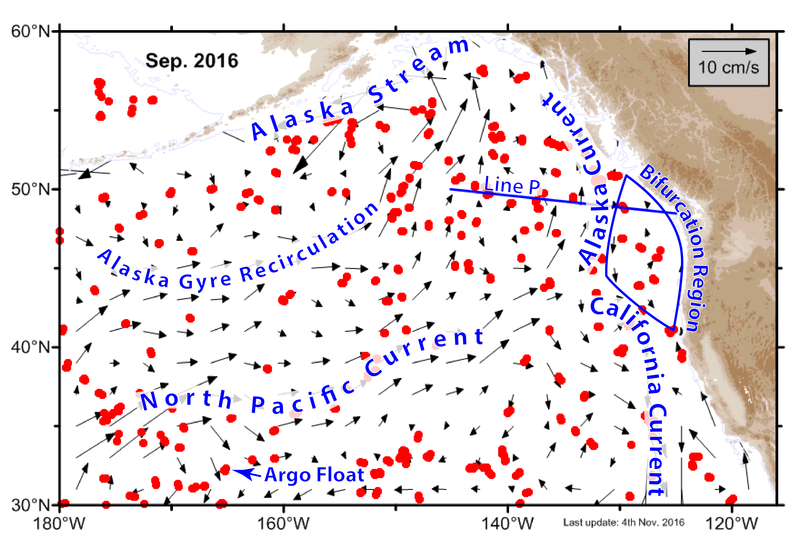 To get an estimate of how fast the currents are moving the plume, we look to the drifting network of Argo floats. Nearly 4000 of these disposable $15,000 floats are currently drifting around the worlds oceans collecting a vertical profile of the water column’s properties (temperature, salinity, and in some cases oxygen, nutrients, fluorescense, etc.) every 10 days. Untethered, these floats drift with the currents at depth, and by calculating the distance between surfacing locations, we determine the speeds of the currents. Mind you, this calculated current speed is not truly a measure of the surface currents, but using these float data to feed a computer model can give us an approximation that is among the best available. Here is an annotated plot of the current velocities as determined by Argo floats from September 2016. You can see that the velocities, indicated by the length of the black arrows, are strongest in the centers of the current systems, but are rather slow and less organized in the bifurcation region, with speeds of only about 1 cm per second. At about the speed of a fast slug, this region is a coastal buffer zone that is largly why the plume signal has been slowed as it approaches the coast. The location and dimensions of this bifurcation region, as previously mentioned, are determined by the strength of the predominant wind field, but do not vary seasonally and so are only discernible through the Argo float data. Also of note, while the Vancouver sample from July was among the lowest of the dataset, the September sample was again in line with a slight increasing trend. The temporary downturn in measured activities within the Strait of Georgia samples may have been due to the influence of fresh water input as snowmelt influenced the surface layer of the region. Salinity analyses from these samples are still pending and a more thorough analysis will be forthcoming to test this hypothesis. Much of the delay in releasing new coastal monitoring data since our December update is attributed to our ongoing commitment to validate our findings from 2015 salmon sampling. This process entails rerunning each of the freeze dried samples, previously run at Health Canada’s Radiation Protection Bureau, for an additional two weeks on the gamma spectrometer in the Cornett Lab at the University of Ottawa. When results are available, we can determine if, and why, there are differences in the measurements from the same sample between the two detectors. Since samples from the InFORM project may be run on one of four different detectors, and each detector is in a different location, this intercomparison process allows us to say that the results from each detector are comparable and that we are not introducing a systematic bias with our methods. So far, four of the six salmon samples from 2015 have completed the intercomparison analysis at the University of Ottawa taking 8 weeks of time on that detector. Since the detector was in use for those samples, it then slowed our analyses of the coastal monitoring samples. To enable reporting of coastal data, a few of these samples are interspersed between each salmon sample. With two salmon samples still in the queue, there is a possibility that more coastal data will not be released in April, as would normally be expected. We will compose a post for the results of the intercomparison analyses when they are available. The February Line P cruise was a stormy one, yet still productive according to the stories I have been hearing from those aboard collecting samples. We expect that data from the August 2016 cruise should be available for release soon.